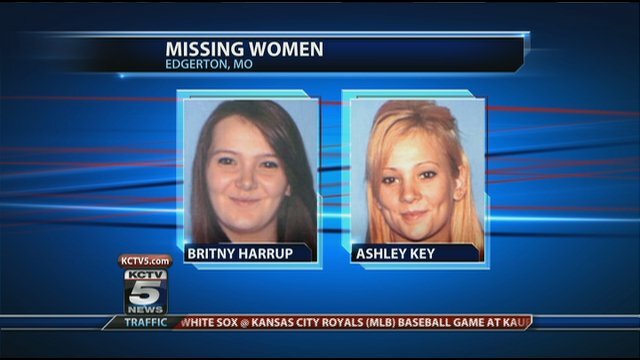 19 year old Britny Haarup and 22 year old Ashley Key have been missing since Friday, July 13, 2012 in Edgerton, MO. Police were tipped off as to the two women’s disappearance after they received a call that two young children were found in their cribs had been left unattended at home early Friday evening. The children were supposed to have been in the care of Haarup and Key. The children father is currently taking care of them. They are believed to be in a white 2002 Dodge Ram 2500 pickup with Missouri license plate 3WP832. The pickup truck has been found Saturday afternoon. Haarup is described as 5’3″ and weighing about 130 pounds. Key is about 5’5″ and weighs about 100 pounds. Saturday afternoon, a truck matching the description of the one they were believed to be in was found unoccupied along 200th Street, along Clinton County Line Road, just west of U.S. Highway 169. Saturday afternoon, a truck matching the description of the one they were believed to be in was found unoccupied along Clinton County Line Road, just west of U.S. Highway 169. The truck was found two to three miles southwest of Trimble, MO. Deputies spent Saturday searching the fields near the truck and Kansas City police brought in their helicopter to help, but nothing was found. The Edgerton Police Department received a call of two young children that were left at home unattended Friday evening. Haarup, the mother of the children, and Key had been watching the young children. According to family members the two women would have never left the children alone. They also stated that they found blood inside the house, although sheriff’s deputies aren’t releasing any information about what kind of evidence they’ve found there. If anyone has any information about the women should contact the Platte County Sheriff’s Office at 816-858-3521 or the TIPS Hotline at 816-474-TIPS. Officials from Platte and Clinton counties searched the fields. Kansas City police helicopter officers helped from the air. The truck was taken to the Kansas City crime laboratory to be processed, said Capt. Joseph King of the Platte County Sheriff’s Office. Authorities still don’t know if foul play is involved, but King said it is hard to fathom that the women would have left the truck on a dusty country road and walked away. For more updates, comments, opinions and to provide your own, go to Scared Monkeys Missing Persons Forum: Britny Haarup/Ashley Key.